The Australian Transportation Safety Bureau (ATSB) concluded that a stickshaker activation event on a Boeing 717 happened because an incorrect weight had been entered in the FMS. On 13 October 2010, a Boeing 717-200, registered VH-NXD, was being operated by Cobham Aviation Services Australia, on a scheduled QantasLink passenger flight from Perth (PER) to Kalgoorlie (KGI), Western Australia. On board were 97 passengers, three cabin crew and two flight crew. 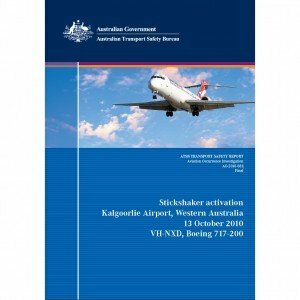 During the approach to land on runway 29 at Kalgoorlie Airport, the stickshaker activated. The copilot, who was the pilot flying, reduced the aircraft’s pitch angle and continued the turn onto final. About a minute later, the approach was no longer stabilised and the flight crew conducted a go-around. On the second approach to land and after turning onto final, the copilot noted that the aircraft was below the required profile. As the copilot increased the aircraft’s pitch attitude, the stickshaker activated for about 2 seconds. Following recovery actions, a go-around was conducted. The third approach was conducted by the pilot in command at an airspeed that was about 15 kts higher than the previous approaches. The investigation found that the stickshaker activations were primarily a result of an incorrect approach speed. The approach speed generated by the flight management system (FMS) was based on a landing weight that was 9,415 kg less than the aircraft’s actual weight. Prior to departure, the flight crew had inadvertently entered the aircraft’s operating weight in lieu of the aircraft’s zero fuel weight (ZFW) into the FMS. The data entry error also influenced the aircraft’s take-off weight (TOW) in the FMS. The error went unnoticed and did not manifest as an operational problem until the approach into Kalgoorlie.